Since I'm going through my own personal challenge/New Years Resolution to read 100 books in 2012 , and I've read some books that I have really, really enjoyed and thought it would be a shame not to share some of them with you. At this point in the game, I have read enough books to feel overwhelmed at the prospect of reviewing them all so I'll start with the ones I've read most recently (ie. over the weekend). Click on any of the images below to view them in Amazon. If you can't see the images, pause your adblocking program on your browser and reload the page. First up, is Divergent by Veronica Roth. While lamenting about having to do laundry and not having any jeans to wear, I eyeballed my "clothes-I-will-be-able-to-wear-when-I-lose-weight" pile. 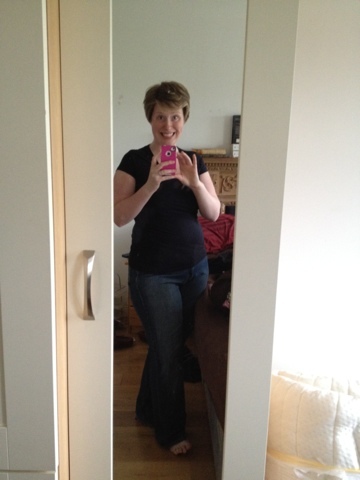 Knowing that my jeans would come close but probably not button, I tried them on anyway... you know, just to see. To my utmost surprise and delight, they not only fit but do so comfortably! Who has two thumbs and is down a jeans size? THIS GIRL!!! Tell me your feel good moment in a comment below!